For over 10 years the traditional Brazilian shipyard Intermarine associated its brand to an international group building its models by license. Due to the substantial changes that occurred on the market after 2008, the partnership became untenable. 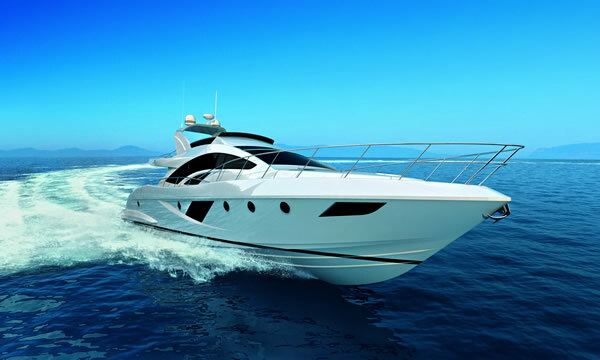 Therefore Intermarine came back to its origins and started the development of a totally new and own product range. At the Rio Boat Show 2011 Intermarine launched the new Intermarine 75 and also the new Intermarine 60 and new Intermarine 42. 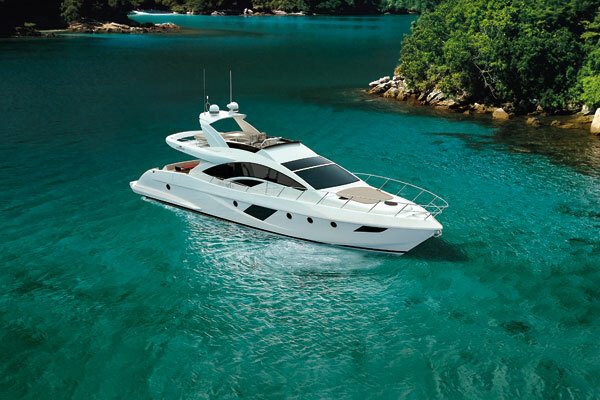 At the upcoming São Paulo Boat Show 2011, in October, the shipyard will launch the new 53 and 65. Before the end of the year Intermarine will also launch the new 55, designed in partnership with the studio BMW Group DesignworksUSA. 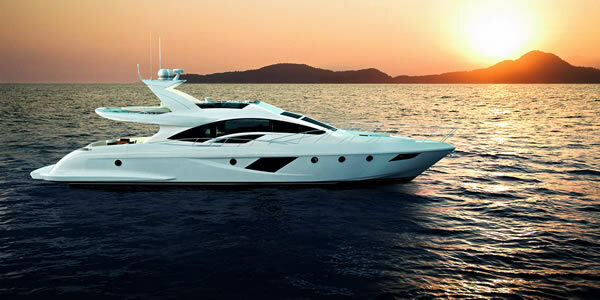 The new Intermarine 75 was designed by the Miami and Viareggiobased studio Luiz de Basto Designs. The new model was pre launched the São Paulo Boat Show 2010. With 77 feet in total length, the new Intermarine 75 was designed to serve the owner who demands the best of design, space and comfort in a yacht. 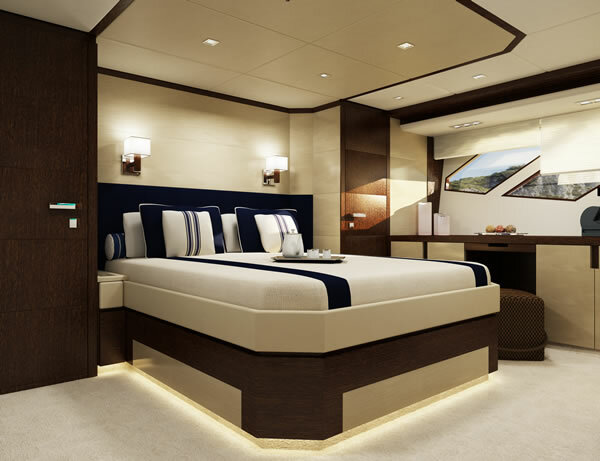 It has four luxurious suites, no bunks, a unique feature of the new model, and two crew cabins. It accommodates perfectly, on overnight stay, eight people and four crew members. 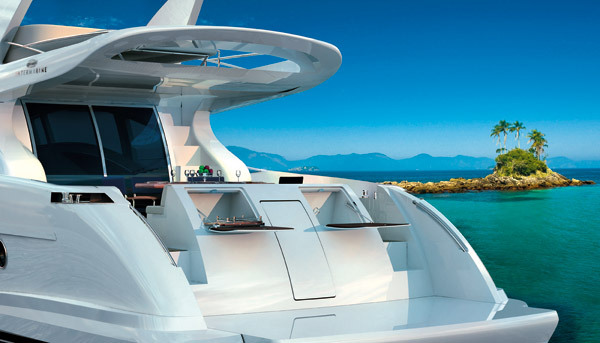 The new Intermarine 75 is undoubtedly bold and stylish. The large windows of the saloon are some of the most expressive elements of design of the new model. 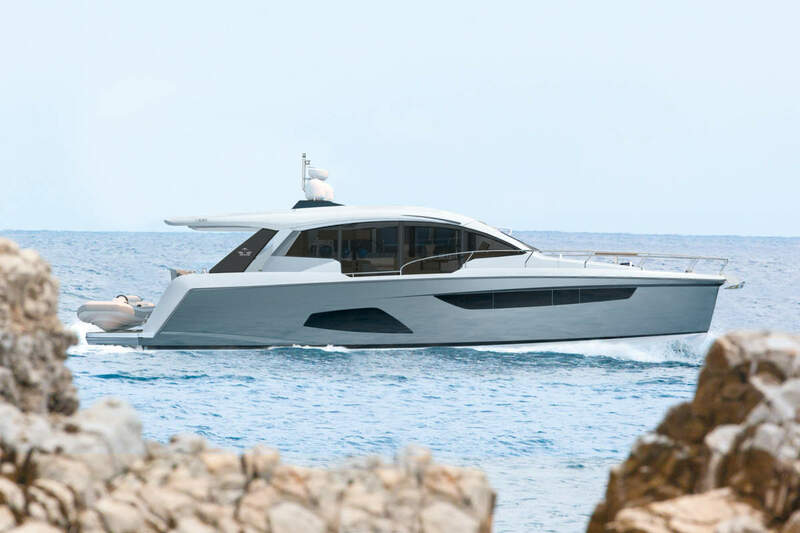 The generous windows in trapezoid format, in the bow and in the master suite, enclosed by a crease in the broadside, make the new Intermarine 75 an unique yacht. The remarkable style of the flybridge arch adds even more stateliness. The swim platform of new Intermarine 75 is a true deck over the sea with 2.10 meters in length (6.88 feet). It has hydraulic lift that allows hoisting with practicality a tender or jet ski or even make it a private beach on board. It also features a practical gourmet area equipped with sink, grill and space for food preparation, an innovation for a yacht of this size. The cockpit was conceived to enjoy the outdoor days at its most with unrivalled space to welcome the guests. It has a comfortable sofa, dining table, ice-maker, cooler and several storage compartments. 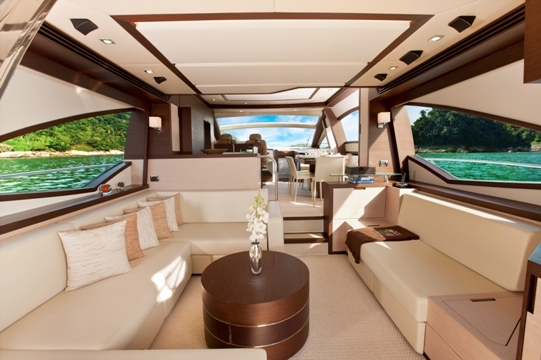 The flybridge of the new Intermarine 75 has generous dimensions. The helm station has two beautiful seats. Practical and smart, the space arrangement also includes a large solarium which accommodates up to three people and a large sofa with a dining table behind the helm station, complemented by an additional solarium. It also has a bar with sink, refrigerator and grill. Another distinguishing feature of the flybridge is its flexibility, allowing the owner to choose an alternative furniture layout that best meets his requirements before the construction of the yacht. Panoramic view. 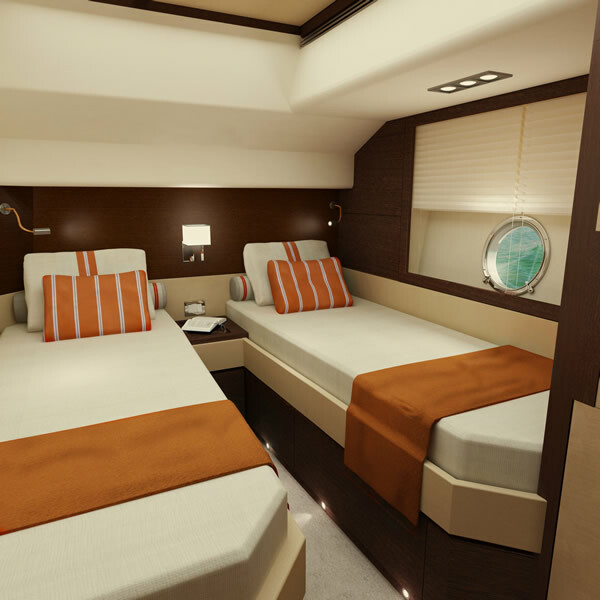 This is how you will see the world from the new Intermarine 75´s saloon. Carefully chosen materials compose the ambience divided between the living, dining room, galley and helm station. The living area has a large U-shaped sofa, an additional sofa, a coffee table and furniture that combines the audio and video equipment. Forward, to port, is the galley. Fully equipped and integrated into the lounge, it allows preparing meals while enjoying the beautiful sea view, together with friends. To starboard is the dining table that actually holds eight people, with more space and seats than it is found in the category. A door on the side of the saloon gives access to the walkway. At the helm station, with two comfortable seats, a large glass ceiling goes after the top of the windshield, bringing much more light and charm to the interior of the new Intermarine 75. One interesting feature created through a deep engineering study is the windshield that has no mullions at its center. Besides being aesthetically more pleasant, it improves the visibility considerably. In the lower deck are the four suites. 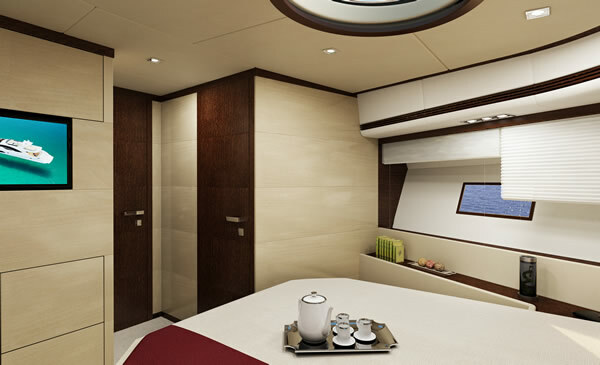 All very spacious, airy and they all have bathrooms with closed box, another unique feature of the yacht. 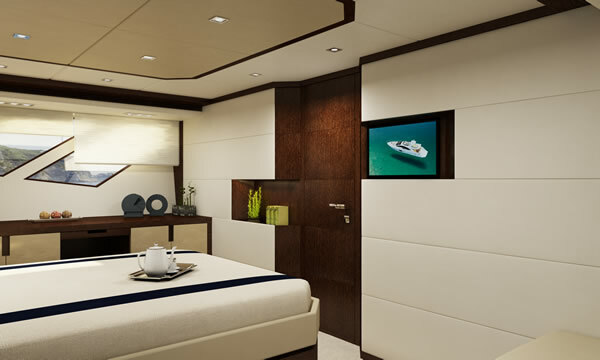 The master suite, located amidships, has a queen-size bed, outstanding windows, bathroom and closet. 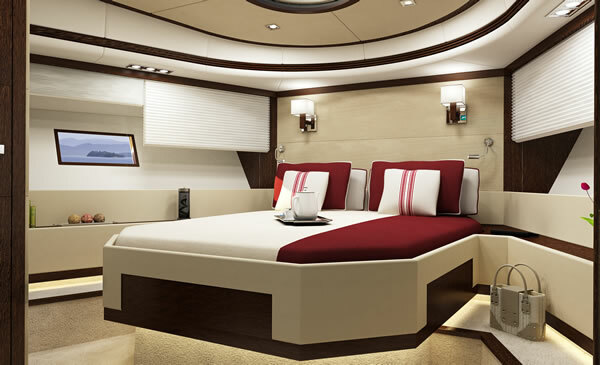 The VIP suite in the bow has a queen-size bed, large windows and bathroom. The two guest suites have two twin beds each and private bathrooms. The crew area also received special attention in the new Intermarine 75, with unique features in the category. 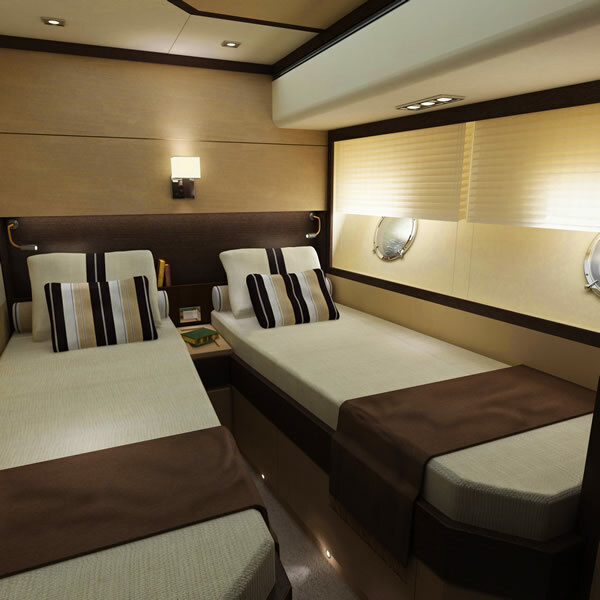 It was designed to ensure comfort for the crew and at the same time, privacy to the owner. It is accessed by a door in the swim platform and has two cabins that accommodate up to three crew members, living room equipped with sofa, dining table and TV, galley, laundry and bathroom. 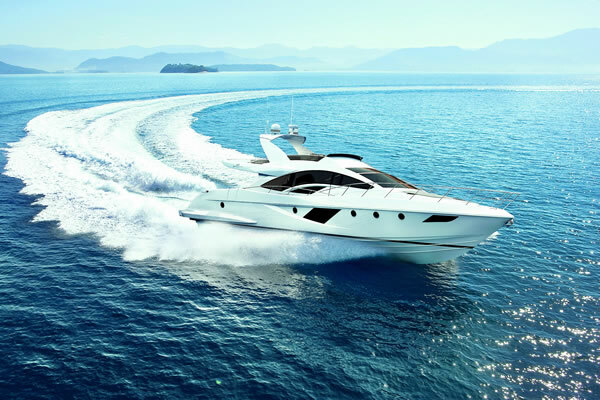 The new Intermarine 75 can reach a top speed of 34 knots and a cruise speed of 30 knots, excellent for a yacht of its size. 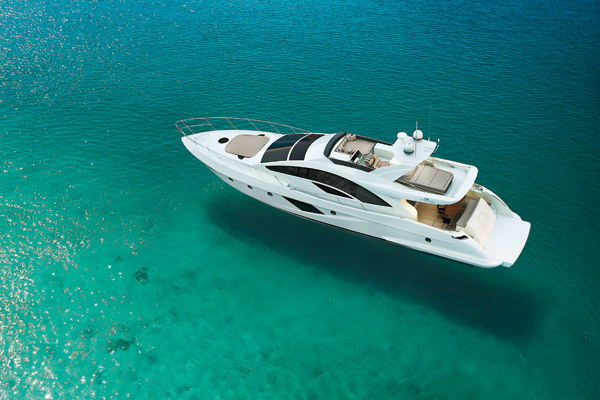 The 75 is powered by 2 x 1,550 hp engines and others options can be installed according to the owners preference. Great to see so many new Sports Cruisers coming from Intermarine, be interested to know if they ever intend to show them off at Boat Shows in Europe and see what type of response they get.